This weekend training will be a learning adventure of joy, great fun, plus a Let Your Yoga Dance reunion with new and old friends from different tribes. There will be lots of interesting information to learn, and of course daily Let Your Yoga Dance, moving yoga, and qigong. 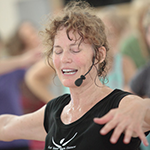 Learn how to take a Let Your Yoga Dance class and turn it into a workshop! I have 35 years of experience designing and directing workshops, so you will be in very capable hands! You will learn how to create workshops of any length – from 3 hours to 3 days – or more! Space is limited and people are signing up, so don’t lose your space!